Brisbane's Next Big Suburb Griffin. Griffin is the next suburb to be transformed by development. 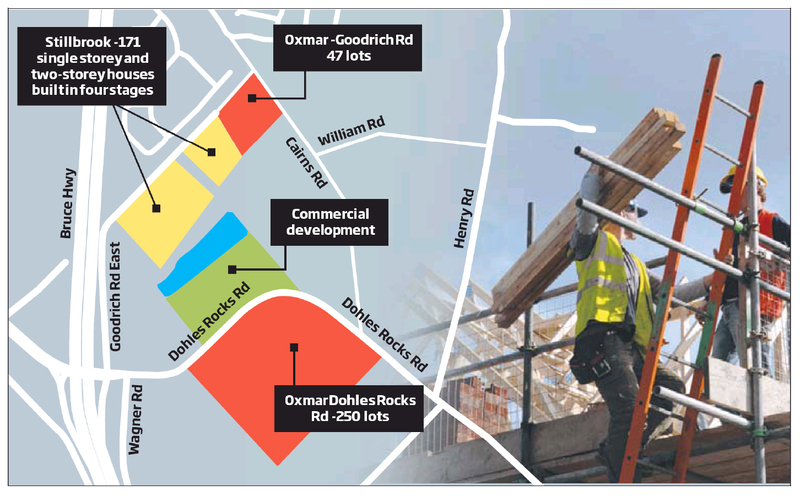 Housing estates are already springing up east of the Bruce Highway on either side of Dohles Rocks Road – and in the next two years development will gather pace. A “neighbourhood centre” commercial development is also due to be built. The 4ha of commercial space is likely to include a Storage King outlet scheduled to open in 2015. There will also be a service station, gym, fast food outlets, offices, commercial services, retail showrooms, medical centre and veterinary clinic. Residential developers include Oxmar Properties, with two sub divisions, the 47 lot Griffin Retreat and the 241 lot Griffin Crest. Between that estate and Dohles Rocks Road are the first 50 townhouses of Stillbrook Estate, by Denmack Griffin. When its four stages are completes, Stillbrook will have 171 single and doubly-storey townhouse and shared recreational areas and pools. Griffin Retreat is offering blocks from 375-600sq m while Griffin Crest will sell blocks from 375-700sq m.
Denmack is selling stage two of Stillbrook and Oxmar is processing expressions of interest for Griffin Crest and Griffin Retreat. Developer Phil Murphy, of Oxmar Properties, said Griffin ticked plenty of boxes. “There are schools and shops nearby and it is not far from hospitals,” he said, adding that the new Moreton Bay Rail Link would also improve the suburb’s public transport options. Article written by Bernie Dowling for the Pine Rivers Press.